I've made this omelet every single day this week (with different veggies and/or havarti cheese...mmm). 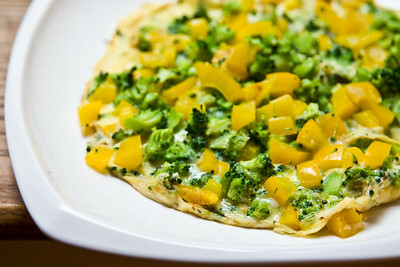 Omelets are so easy to make... and, as I've recently discovered, the non-stick wok I have is a perfect omelet pan. If the egg is mostly cooked before the ingreedients come in and it's folded around them, then it's an omelet. If the eggs are only partially cooked before they come in and it's finished like a pizza then it's a frittata. And if they meet up while the eggs are still raw, and it's baked in the oven, then it's a quiche. P.S. welcome to smugmug, not sure when you moved over from flickr, but I just noticed the smugmug urls today. i'm actually on both smugmug and flickr... double posting the food stuff on flickr is annoying, but there are a lot of good food photo resources there. best of both worlds!